One of the best ways to give a bit of sophistication and movement to any space is through the addition of contrast. Just a little bit of contrast goes a long way in making a room stand out, serving to accentuate the room’s best qualities. There are many different ways to add contrast through décor, but few create the striking visual that black and white cement tile provides. Our black and white tile delivers its signature contrast and movement to a variety of settings, such as kitchens, bathrooms, entryways, or even patios in some areas. Wherever you choose to place your black and white cement tile, you can be sure that you’ll enjoy your space’s new level of complexity. Each and every one of our custom black and white tiles is hand-designed to deliver the most impressive visuals possible Riad’s seasoned craftsmen specialize in the creation of modern tiling using time-tested methods, perfectly marrying classic visuals, contemporary design, and high build-quality to create only the finest cement tiles. Like our other products, our black and white tiles are made by hand-pressing a layer of finely ground Portland cement with a layer of coarse sand and cement, imbuing each tile with its unique signature texture. After the initial pressing, our craftsmen carefully add the layer of natural, hand-mixed pigmentation, giving the tile its gorgeous pattern. Each of our tiles are individually handmade and inspected by our craftsmen, all but guaranteeing their quality and consistency. 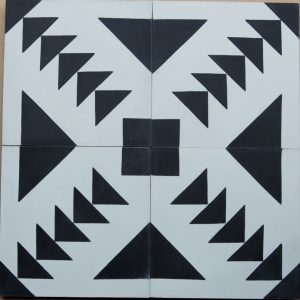 Black and white tile is perfect for homes of all shapes, sizes, and styles, and Riad Tile has a variety of different designs to choose from. Whether you’re looking to modernize your kitchen or add a practical and gorgeous material to your bathroom, our tile is an ideal addition. Riad is dedicated to handcrafting premium cement tiles suitable for many different homes and decorative styles, and our black and white cement tile has been a favorite of many of our customers. If you’re looking for consistency, durability, elegance, and style, look no further than our black and white tile. If you are uncertain of which tile to purchase, where to place it, or how it should be installed, please feel free to contact us! Nothing makes us happier than helping our customers get the most out of their tile, and we are always thrilled to help you through the decision-making process. Please reach out to us with any additional questions you might have, and don’t forget to order a sample to see our premium black and white tile in person!